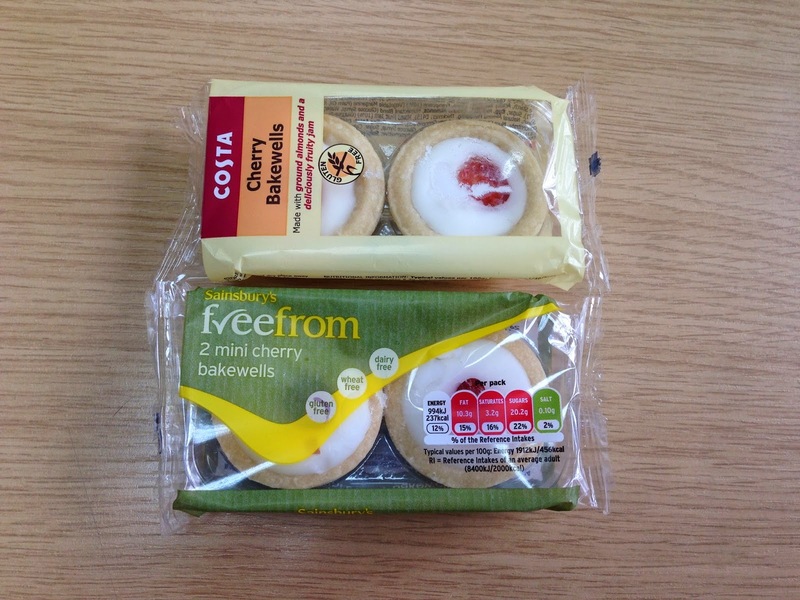 Hannah's Gluten Free : The Fight of the Bakewell Tarts! Recently a Costa Coffee opened across the road from my office which has made the local Sainsbury's Cafe up their game too, as they are less than a minute walk from each other! The gluten free sections in both these places are growing and as a result I am eating more than I should! Sainsbury's have only just started to stock these and I found them in their main store too, which is great! Both are packaged in a very similar manner and look very similar, a minor complaint I have with the Sainsbury's packaging is that there is no lip to the inner plastic sleeve like the costa one so some of the icing gets stuck to the packet, but I just pick it off! Lets look at the basics in terms of nutrition, the calories, fat and carbs are what I tend to look at on sweet treats, these values are for the two cakes in the pack as one serving. I think Sainsbury's is the better choice if you are watching your calories and carbs but they are more or less on a par on fat. But what would you expect from a cake! Both cakes have a lifespan of roughly a month from day of purchase so there is no need to worry about them going off. As for taste there is not really any difference I find the Sainsbury's bake well is much a softer filling and icing. So I think it is down to personal preference to whether you like a softer icing or firmer! As the taste of them both I find them to be so accurate to 'regular' bakewells which I used to LOVE. I do find they are a very light coloured pastry which made me apprehensive but it tastes amazing, they are not crumbly and there is no odd powdery texture or aftertaste. I will be enjoying both as I feel that this battle has no clear winner! And for the sake of 25 calories I wouldn't go out of my way to buy one or the other. They are both tasty and I think I need to stop them before I look like cherry bakewell!